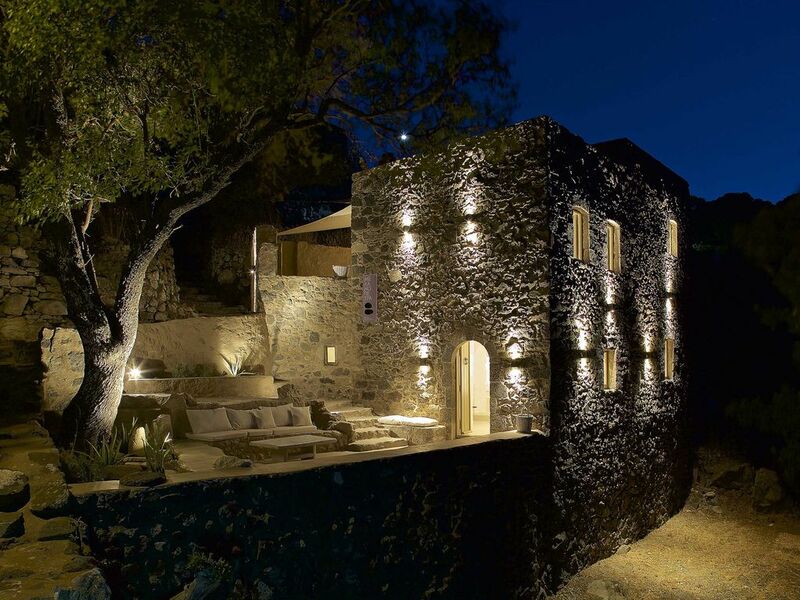 Melanopetra is a 1850 two-storey stone residence built into the core of the beautiful preserved traditional village of Emporios in Nisyros island, turned into a stunning atmospheric villa of two luxury apartments. Lovingly restored by the owner and architect Anna, it combines modern minimalistic design with the eternal aesthetics of local architecture to create a harmonic whole with high standard services in a warm manner that reflects traditional hospitality. The villa delivers unpretentious style and homely comfort, in a context that retains the distinctiveness of the authentic. Its name is inspired from the main building material, the local black stone, further enhancing its character. Emerging from the rocky volcanic landscape the villa is a small paradise in itself, exuding subtle luxury, eternal elegance and authentic ambiance. Its privileged location in a truly original environment with the breathtaking view of the Aegean sea and the volcanic aura, create a truly unique atmosphere around the villa, seemingly untouched by time. The emanating serenity and the offering warm hospitality contribute to its simple charm, in a landscape of natural Aegean Sea beauty. Nisyros is an island that has preserved an atmosphere largely untouched by crass commercialization and is not characterized by crowded beaches and scores of souvenir shops. Offers wonderful landscapes and walking paths, beautiful beaches with black sand and a clear sea, small old churches and monasteries of a rich history and lovely Greek villages with nice restaurants and bars. In sum, this spectacular island, one of the best-kept secrets in Dodecanesos, is a wonderful island for your holidays! The two-storey villa is comprised of two independent luxury apartments, upstairs and downstairs, both having access from ground level and a private yard. They feature infrastructure of high-quality and austere aesthetics with all modern appliances, amenities and comforts. They contain minimalistic design furniture, breathtaking sea view, independent heating and a fully equipped kitchen with all modern appliances including ceramic hob, refrigerator with ice maker, and dining table for 3 people. They have also bedroom spaces in separate levels, a wooden closet and en suite modern bathroom with shower. The living rooms have a comfortable sitting corner of built-in sofas that can accommodate an extra person, wooden table, and digital LED TV. The private outdoor spaces harmoniously integrated into the stone-built environment have comfortable sitting areas which offer breathtaking view of the Aegean Sea. Melanopetra can comfortably accommodate an overall of 4 adults and 2 extra persons or children. Each apartment may be booked separately, or the whole villa by a family or group of friends. I am the owner and architect of Melanopetra with master in restoration of Historic buildings. I have lived in this island for some years working as an architect and i have also awarded a Europa Nostra Prize for the restoration of the ancient fortification of Acropolis in Nisyros, dated back to 5th c. B.C. Emporios is a picturesque preserved traditional village on the rim of the caldera situated at an altitude of about 400m, overlooking the Aegean Sea and Volcano. It was mostly abandoned and many houses are in ruins, but recently began to revive and turn into an alternative destination for artistic and sophisticated public. My love for this vibrant island forced me to buy and restore this unique property with great care in order to share it with guests offering a warm hospitality. The restoration project was implemented through European co-financing as a contribution to the sustainable development of the island. Nisyros is an island that has preserved an authentic atmosphere seemingly untouched by time and crass commercialization and offers a rare experience to eclectic guests, and me. Melanopetra combines modern minimalistic design with the eternal aesthetics of local architecture to create a harmonic whole with high standard services in a warm manner that reflects traditional hospitality. The villa delivers unpretentious style and homely comfort, in a context that retains the distinctiveness of the authentic. Emerging from the rocky volcanic landscape the villa is a small paradise in itself, exuding subtle luxury, eternal elegance and authentic ambiance. Its privileged location in a truly original environment with the breathtaking view of the Aegean sea and the volcanic aura, create a truly unique atmosphere around the villa, seemingly untouched by time. The emanating serenity and the offering warm hospitality contribute to its simple charm, in a landscape of natural Aegean Sea beauty. From the moment you step up into the terrace, the view, the villa, everything about Melanopetra is simply breathtaking. Architect / owner Anna has done beautiful work in restoring what was once a ruin - keeping the exterior tastefully traditional, with a chic, minimalist interior which makes great use of limited space. Melanopetra is located in a tiny village and is surrounded by ruins and other little villas, and lots of tranquility. We were welcomed at the port by lovely local Haris who also rents cars, and runs the travel agency in Mandraki - he was super welcoming and accommodating, helping us with whatever we needed. Take a pullover as the evenings can sometimes get quite windy sitting on that beautiful terrace. The images are true to reality - you won't want to leave. Ever. We will definitely be going back. Blick zum Meer. Hier genießt man die Ruhe in einer tollen Umgebung. einfach unbeschreiblich schön sind. Hier zu leben ist einfach traumhaft. Thank you so much for appreciating our big effort to offer exactly the experience you are referring to.. The unique natural and built environment was greatly inspiring for us too. Looking forward to welcoming you again in this inspirational volcanic island and the volcanic stone-built "Melanopetra" ! Nearest coffee/bar Aposperi, 30 meters from the property in the village.